WWI Profile: Robert Bollie Stanley 1894-1961 | Friends of Fort Caswell Rifle Range, Inc.
Robert Bollie Stanley was born and raised in Shallotte, NC, where most of his family remained throughout their lives. The 1900 Census lists his father George (1870-1931), with mother Francis (1870-1957) having two children, all living. Besides Robert: his sister Hattie E (1896-1936) and later, Ellen (1902-1975). His father and mother are buried in Stanley Cemetery (Brierwood Golf Course). Robert’s WWI Draft Registration of June 1917 lists his occupation as laborer at Southport Fish Scrap & Oil Company, living in Shallotte, NC, and unmarried. As the previous two WWI Veteran Profiles recounted, Robert was honored with a position in the 365th Infantry, 92nd Division, along with William Frederick Brooks, who sadly had died of meningitis days before the infantry left for France, and William James Gordon, all from Brunswick County. The passing months of training, drilling, and the occupation, then command, of the St. Dié Sector, was leading up to the main offensive that eventually ended the war: the Meuse-Argonne Offensive. A diary written by the captain of their infantry brings the countryside and experiences alive. One entry in August describes his first experience of shell fire, giving a glimpse into what Pfc Gordon and Pvt Stanley were experiencing. I had my first experience of shell fire. It is an experience that one cannot well describe. You hear the boom of the distant gun then the rushing whine and screeching of the shell as it passes, then you wait for the terrific explosion wondering how far beyond you it will strike. It sure causes a weakness in the knees and a funny feeling up your back. The man that says he was not scared at those first shells he heard is either a damn fool or a liar. The Meuse-Argonne Offensive, September 26 – November 11, 1918, was the southern part of the great triple offensive that broke the German lines on the Western Front and ended with the signing of the armistice. The Meuse-Argonne front (the area around the Meuse River and Forest of Argonne) had been practically stabilized in September, 1914, and, except for minor fluctuations remained unchanged until the American advance in 1918. The net result of the four years’ struggle on this ground was a German defensive system of unusual depth and strength and a wide zone of utter devastation, itself a serious obstacle to offensive operations. The strategical importance of this portion of the line was second to none on the western front. All supplies and evacuations of the German armies in northern France were dependent upon two great railway systems: the southern one, where the 92nd Division was located, being the Carignan-Sedan-Mézières line. Should this southern system be cut by the Allies before the enemy could withdraw his forces through the narrow neck between Mezieres and the Dutch frontier, the ruin of his armies in France and Belgium would be complete. The operations in the Meuse-Argonne battle really form a continuous whole, but they extended over such a long period of continuous fighting that they will here be considered in three phases, the first from September 26th to October 3rd, the second from October 4th to 31st, and the third from November 1st to 11th. 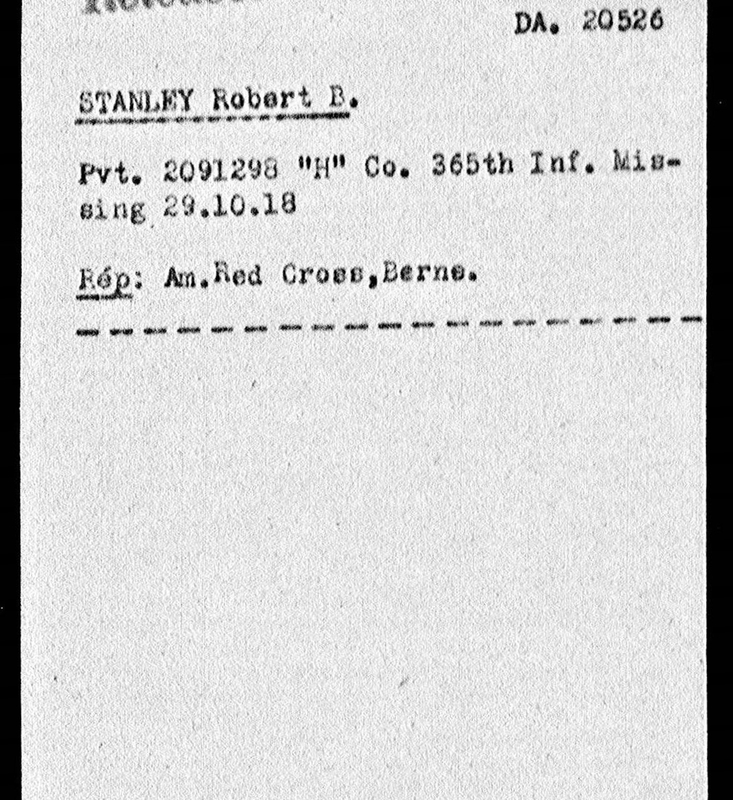 It was during the second phase that Pvt Robert Stanley was reported MIA. On October 9, the 92nd Division relieved the French 68th Division and assumed command of the Marbache Sector. Their mission was to hold the line of the First Army east of Moselle, harassing the enemy by frequent patrols. The 183d Infantry Brigade occupied the front line with the 366th and 365th Infantry Regiments in line from right to left. 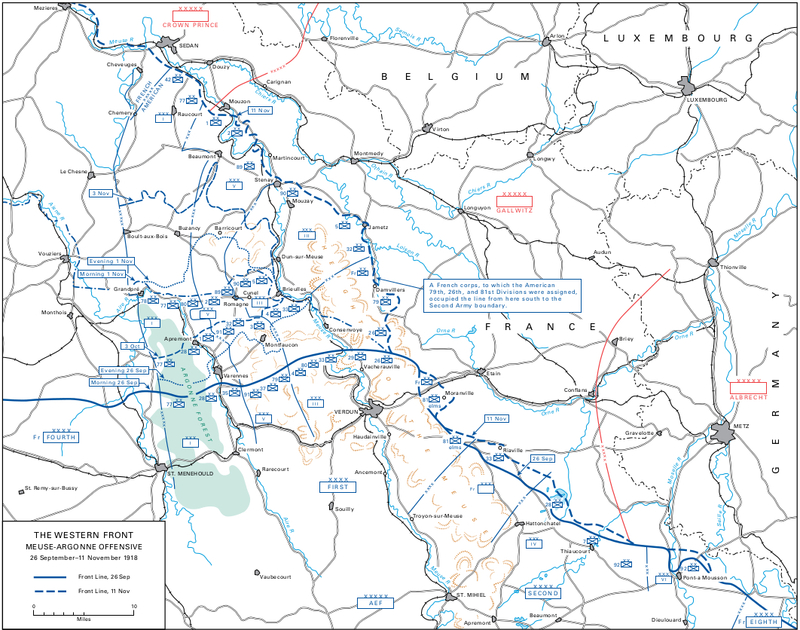 The advance of the 92nd Division can be seen in the South East corner of the map shown at Pont a Mousson. During the period October 9-31 the division was engaged in patrolling on the front. The danger of the assignment was reflected in the casualty reports. In the one month of patrolling, there were 23 Killed in Action or Died of Wounds, 362 Wounded, and somewhere in the neighborhood of 32 Missing, which included Pvt Robert Stanley. 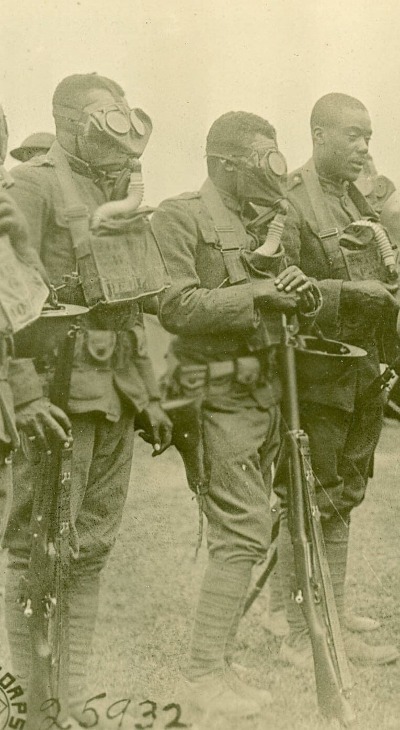 The French decorated members of the 365th Infantry and 350th Machine Gun Battalion for their aggressiveness and bravery. Source: Men of the 366th during Gas mask drill. The 366th was in the 183rd Infantry Brigade with the 365th. By the end of October, the First Army had accomplished the first part of its plan for the Meuse-Argonne Offensive and was ready to undertake the second operation, i. e., cut the Carignan-Sedan-Mézières railroad, and drive the enemy beyond the Meuse. It was planned that an attack to accomplish this would be launched on November 1. The last week of the war took a heavy toll, especially as the Germans grew more desperate and lobbed an enormous amount of poisonous gas in their direction. Pvt Stanley was still missing. He would not be released until November 27. 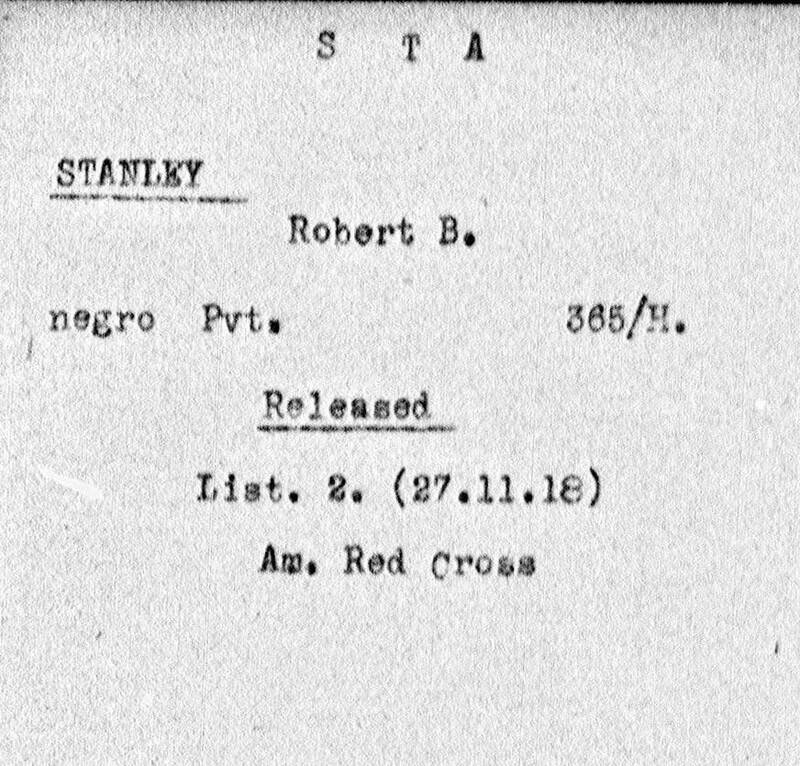 Pvt Robert Stanley returned to America on March 24, 1919, with his right leg amputated at the thigh (source:ancestry.com). He was not discharged until August 25, 1919, with a 95% disability classification. After the war, Robert married Ethel Harrison and had several children (total number unknown). Little else is known about this hero from Brunswick County. Robert Bollie Stanley was laid to rest September 22, 1961, in the same cemetery as his parents. A military headstone was not requested, so no WWI honors are displayed, giving no indication he made such considerable sacrifices for his country.